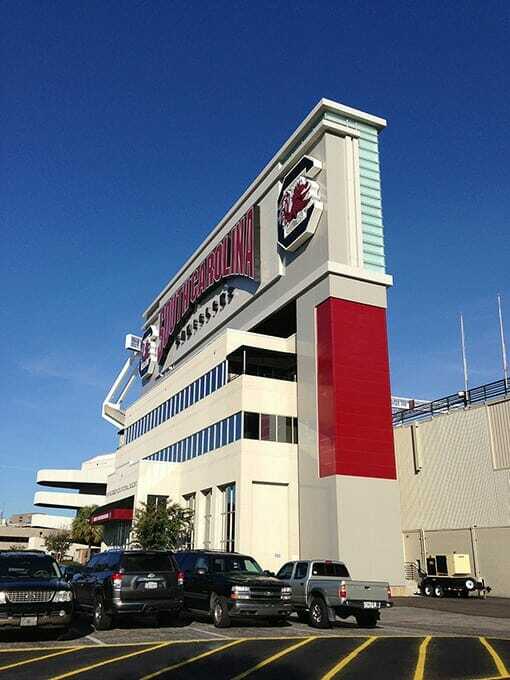 The goals of this project were threefold: design a structure to support the new video board, which is currently the third largest in the SEC, for Williams-Brice Stadium; clad the structure in such a way that it blends in and complements the stadium; create an identity for that end of the stadium which displays and enhances the USC brand. The steel super-structure was designed to span over the existing office building at the north end of the stadium, on which the previous video board was secured. The use of 3 different colors of aluminum composite paneling and slight sifts in plane breaks down the large scale of the structure. The large expanse of the structure on the north end of the building created an opportunity to show off the University brand with back-lit signage. Finally, an aluminum curtain wall window system with frosted glass provided accents at each corner of the structure and LED lights within added an extra element of drama to night games.